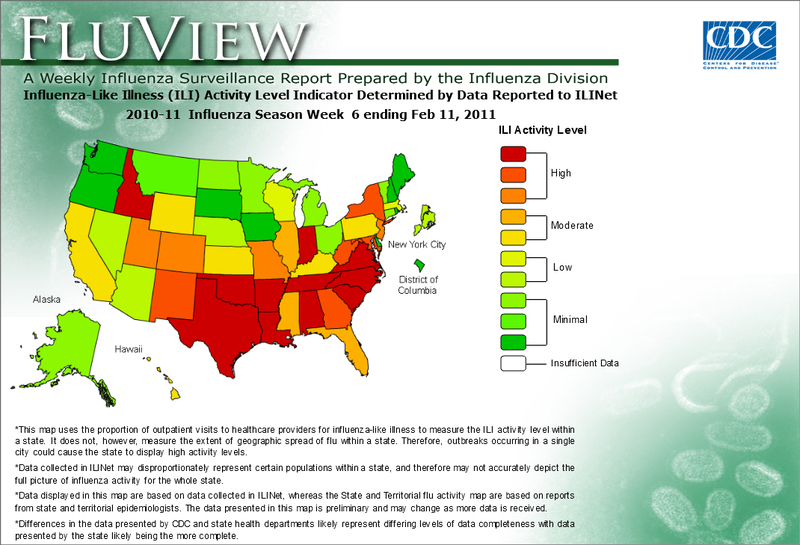 As of mid February 2011, influenza activity in the United States remains elevated, but it appears to have peaked in the majority of European, North African and Middle Eastern countries. There were more outpatient visits for influenza-like illness (ILI): 4.5% vs the national baseline of 2.5%, it was above region-specific baseline levels in all US regions. Twenty states (Alabama, Arkansas, Colorado, Georgia, Idaho, Indiana, Louisiana, Maryland, Missouri, New Jersey, New Mexico, New York, North Carolina, Oklahoma, South Carolina, Tennessee, Texas, Utah, Virginia, and West Virginia) experienced high ILI activity. Nine states (California, Florida, Hawaii, Illinois, Kansas, Kentucky, Mississippi, Pennsylvania, and Wyoming) experienced moderate ILI activity. New York City and five states (Arizona, Massachusetts, Nebraska, Nevada, and Wisconsin) experienced low ILI activity. Minimal ILI activity was experienced by the District of Columbia and 16 states (Alaska, Connecticut, Delaware, Iowa, Maine, Michigan, Minnesota, Montana, New Hampshire, North Dakota, Ohio, Oregon, Rhode Island, South Dakota, Vermont, and Washington). The geographic spread of influenza in 37 states was reported as widespread; 10 states reported regional influenza activity; the District of Columbia reported local activity; Puerto Rico, the U.S. Virgin Islands, and three states reported sporadic influenza activity, and Guam reported no influenza activity. Global flu activity (see CDC page for current information), was most prominent in the tropical regions of Asia. From February, cases of respiratory disease were high in Singapore and Hong Kong, and 90% of influenza-positive samples were 2009 H1N1. Influenza activity continued to rise in southern China, where 46% of ILI specimens in Week 5 tested positive for influenza, a 3% increase from Week 4. 2009 H1N1 was the predominant subtype. According to WHO, Madagascar reported an increase in influenza activity, with the co-circulation of influenza B and A (H3N2). There was little influenza activity reported in the tropical regions of the Americas or in sub-Saharan Africa. Influenza activity in the majority of North African and Middle Eastern countries appears to have peaked, except for Algeria, where flu activity increased. The percentage of influenza-positive respiratory specimens was also high in Pakistan, Iran and Oman, where 2009 H1N1 and type B viruses co-circulated in relatively equal numbers. According to the Public Health Agency of Canada, influenza activity increased slightly in Week 5, but remained below the peak reported earlier this season. The percentage of influenza-positive respiratory samples increased from 17% in Week 4 to 19% in Week 5. Since the beginning of the influenza season, 88% of subtyped influenza A specimens have been influenza A (H3N2). According to the China National Influenza Center, influenza activity rose in recent weeks in northern China. In Week 5, 21% of influenza-like illness (ILI) specimens were influenza-positive, and 2009 H1N1 viruses were predominant. WHO reported that Mongolia saw an increase in 2009 H1N1 virus detections, while Japan saw a sharp increase in ILI activity. Activity in the Southern Hemisphere remained low. In Europe, 2 countries (Georgia and Luxembourg) and the Siberian region of the Russian Federation reported very high intensity of influenza activity; 8 countries reported high intensity; 27 reported medium intensity and 4 countries, low intensity. 23 countries reported widespread activity. Of the 25 countries reporting on the impact of influenza on health care systems, 1 (Georgia) reported severe impact; 14 countries reported moderate impact and 10, low impact. Of the 41 countries reporting on consultation rates for ILI and ARI, 8 (Albania, Belarus, the Czech Republic, Iceland, Kazakhstan, the Republic of Moldova, Serbia and Slovakia) reported increases while 6 (Ireland, Israel, Malta, Norway, Spain and the United Kingdom (England)) reported decreases. Influenza activity has apparently passed its peak in 24 countries in this region. In general, the highest consultation rates were reported for children aged 0–4 and 5–14 years. WHO/Europe received sentinel surveillance data on hospitalized SARI cases from 9 countries (Armenia, Georgia, Kazakhstan, Kyrgyzstan, Romania, the Republic of Moldova, the Russian Federation, Serbia and Ukraine). Sentinel SARI hospitalizations are at the highest levels observed for the season so far in Georgia and Serbia. In Georgia, however, outpatient clinical consultation rates declined from week 5 to week 6, while the relative percentage of both SARI and ILI specimens testing positive for influenza B increased. Sentinel SARI hospitalizations in Kazakhstan, Kyrgyzstan, Romania and the Russian Federation have declined somewhat from observed peaks in weeks 3–5, but remain notably elevated above pre-season levels, with 30–50% of sentinel SARI specimens testing positive for influenza in each of these countries. Sentinel SARI admissions in the Republic of Moldova and Ukraine are at levels below prior peaks. Nevertheless, a significant percentage of sentinel SARI specimens continue to test positive for influenza, and the proportion of influenza A detections in sentinel SARI specimens in Ukraine increased in week 6. Further information on the sentinel SARI surveillance systems represented in the EuroFlu bulletin can be found in the “Overview of sentinel SARI systems in EuroFlu”. Intensity: Low = no influenza activity or influenza activity at baseline level; Medium= usual levels of influenza activity; High = higher than usual levels of influenza activity; Very high = particularly severe levels of influenza activity. Great selection and choose Setups. Once you're in the kodidownloadapptv.com the skins menu as well as swap in between them at will Fine. i hate flu season even in summer flu flu and flu!!!! Flu update: Have we passed the peak?